Razer is delaying the launch of its Nabu SmartBand to make sure it doesn't run into the same skin irritation issues beleaguering the Fitbit Force. The revelation came to light earlier today thanks to some tips sent to Engadget, but Razer CEO Min-Liang Tan actually announced the delay on his Facebook page April 4. He said in a post that the laptop and accessory maker is working in concert with medical professionals and is running tests to "make doubly sure that by the time the Nabu gets on your wrists, it is fully certified hypoallergenic." Razer heard about the skin irritation issues facing "other wearables" and wanted to be 100% sure Nabu wouldn't cause the same problems, despite its confidence the digital band is safe to wear. Nabu developer units were originally slated to launch at the end of Q1, however Tan said the release date has been pushed back until "late next month." Fitbit issued a voluntary recall of the Force in March as nearly 10,000 people reported skin irritation caused by the activity tracker. Two hundred and fifty reports concerned blistering. 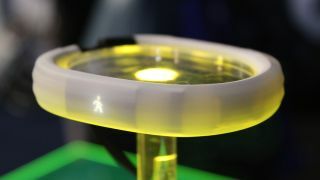 Razer is clearly looking to avoid such a fallout with its unreleased wearable, and Tan said Razer will release Nabu "when it's perfect" and ready for "mass use." Tan's TL;DR summary: "[T]he Nabu will launch when it's perfect. Stay tuned for more updates."